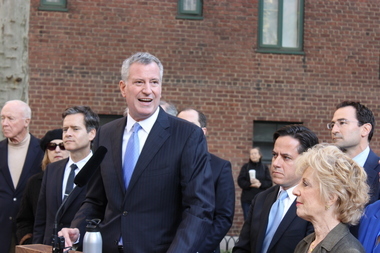 Calling it the "mother" of all affordability deals and the largest preservation deal in city history, Mayor Bill de Blasio said the Stuy Town Plan, to which the city will contribute at least $219 million to keep 5,000 units affordable for 20 years, is a watershed moment for the city. NEW YORK CITY — Mayor Bill de Blasio said his plan to build or preserve 200,000 units of affordable housing is on track with over 21,041 units built or preserved in 2015. That brings the two-year total of his administration to 40,204 apartments built or preserved, enough housing for 100,000 New Yorkers. "That is now putting us ahead of pace to reach our goal of 200,000 units by the end of 2024," de Blasio said during a press conference in Bedford-Stuyvesant. De Blasio said preservation projects like those at Stuyvesant Town and Riverton Houses in Harlem helped the city preserve 13,862. Another 7,179 new units have been financed. "Wherever I go the number one concern is affordability," de Blasio said. More than half of New York City households pay more than 30 percent of their income in rent. But affordable housing groups said the mayor's plan does not do enough for low-income New Yorkers. "Mayor de Blasio’s housing and rezoning plans give most low-income New Yorkers nothing to celebrate or cheer," Jonathan Westin, a leader of Real Affordability for All, said in a statement. The city financed 1,081 units in 2015 for the very low income, families of three making less than $23,300 per year. That represents 5 percent of the total number of units financed or preserved and brings de Blasio's two-year total for those units to 2,000. Westin said that is far too few given the financial demographics of the city. "Too many low-income people are still at risk of displacement and homelessness in de Blasio's New York. Even if they receive a wage increase to $15 per hour, low-wage workers in our city still won't be able to afford the overwhelming majority of apartments under de Blasio’s plans," he added. But De Blasio said many of the units are in reach of New Yorkers of all income levels. In 2015 the city financed 1,618 apartments for the formerly homeless, bringing the two-year total to 2,462. Another 1,087 apartments were financed for low-income senior citizens last year, bringing the two-year total to 2,722. Seventy five percent of the over 40,000 apartments financed or preserved over the last two years have been for the extremely low income, very low income and low income, his office said. "Too many people have been priced out and I think city government didn't do enough to address the issue," said de Blasio who called his 10-year-plan "the most ambitious municipal affordable housing plan in the history of the country."